Spare Tyre Covers are great for advertising and promotion. 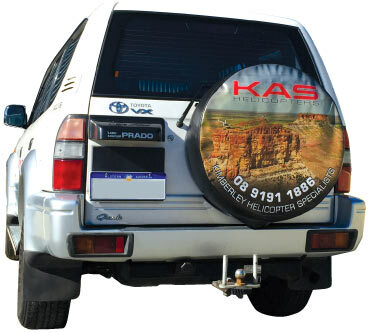 Spare wheel covers are an inexpensive business advertising medium. Whether it is to advertise your business and products or part of a bigger marketing campaign. The covers can be used for promotion of your business or products and being vehicle signage are fully tax deductible. Being vehicle signage, our professional graphic designer understands that your tyre cover needs to instantly catch the eye, while quickly getting your prime message across. We want the wheel cover to work for your business in the most effective way possible. Simplicity is often the best and careful use of logos, images and colour can create an eye catching design. 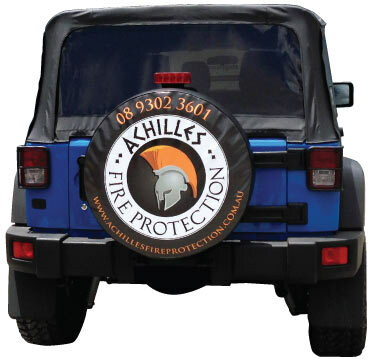 Your custom spare wheel cover is made from high quality materials and guaranteed for 12 months. We have had the covers used by many clients for 5 years or more and they still look great. Giving an exact time frame on the life of your cover can be difficult as we cannot predict the life that it will receive. When you look at the cost compared to longevity, spare wheel covers make for an excellent, very inexpensive form of advertising. When you compare wheel cover advertising to other forms such as newspaper, magazine, tv and radio the cost is simply amazing. The covers last for many years, potentially being seen by thousands of viewers when on the road. We have had many clients tell us their tyre cover paid for itself in the first week, some even on the first day!! Most well designed forms of vehicle signage gives your business a higher degree of professionalism. This gives your clients greater confidence in your business and can also generate more business while on the road. Our spare wheel covers simply look great and are something a little different that people will notice. Please feel free to contact us to discuss or if you have any queries on our spare wheel covers.